Families question where their food comes from and why it costs so much. To stay on budget, many turn to backyard farming, which helps stretch their dollars. Urban agriculture is a booming business and many first-time farmers are taking the challenge. If you have been considering starting a garden or raising some chickens or bees, we’re here to help. Know Local Laws – Communities may restrict the size and placement of gardens and what animals you can raise. Start Small – If you are new to growing vegetables or herbs, consider planting containers first. The next year, if you want more, do plots or raised beds. Talk to Your Neighbors – You may love chickens but your next-door neighbor may not appreciate your rooster’s wake up call. Consider sharing a portion of your yield. Do Your Homework – Raising chickens, bees or goats takes routine care. Research online to determine which breed to buy and how to build their shelters. Join a Co-op – Find a community garden club or organization to join. You’ll gain helpful information while making new friends. Many people think raising chickens is a complicated undertaking but far from it. If you love fresh eggs and how cute these feathery critters are, start building a roost. Designs range from the simplest wood and wire structures to elaborate two-story creations. It is entirely up to you. Choosing the Right Breed –Do you want chickens for the eggs, to eat or both? There are many different breeds. Your climate makes a difference, too. Hearty breeds like Silkies that have lots of fur-like feathers are best suited for colder climates. Some breeds are aggressive so select ones that are compatible. Daily Care Requirements – Chickens eat bugs, worms and seeds but they still need a balanced diet of high protein chicken feed. Fresh water is a must. Protecting Your Flock – Build an attached wire enclosed run onto your coop for your birds to exercise. Never allow them to roam unsupervised. Even in urban areas, there are still plenty of predators (cats, coyotes and hawks) that can injure or kill your chickens. Interacting with the Birds – Chickens are social animals and need interaction. They consider you part of their flock so get to know them. Life Span of Chickens – Hens live from eight to 10 years and their egg production drops off after three to five years. Decide whether you want to keep them as pets, or (you know) ask them to dinner. Despite their stinging reputation, bees can peacefully co-exist with animals like chickens. The birds instinctually don’t go near the entrance to the hive and bees appreciate having the chickens eat the pests that can destroy their hives. Nutrition – One hive can produce 40 plus pounds of honey depending on the climate. Pollination – Having bees in your garden boosts the volume of flowers and vegetables you produce. Ecosystem – By increasing small local colonies of beehives, you help support the overall bee population. Our world depends on bees to pollinate food sources and keep them growing. Commerce – Not only will you have ample honey to sell, you can harvest the beeswax to make candles. Another animal to consider is the goat. Turn these four-legged lawn mowers loose and no weed is safe. Corporate America is even on-board! Google uses them for “landscape management” at their headquarters in Mountain View, CA. Besides the lawn service, you will have an ample supply of goat’s milk for cheese or bath soap plus all the cuteness you can stand. Just check to see if your community allows them before falling in love. 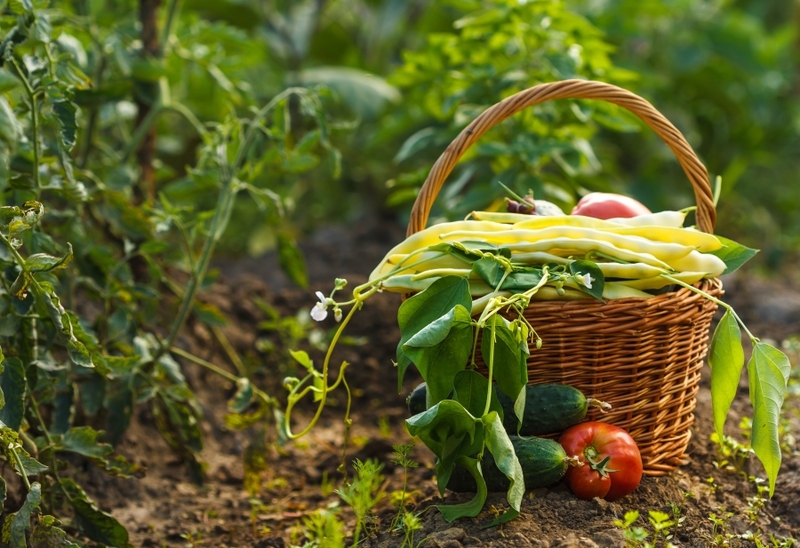 There are so many benefits to be gained from backyard farming. Providing healthier food for your family, improving the environment and experiencing the joy of tending to some amazing creatures are just a few. Take the challenge to become more self-sufficient and live a greener lifestyle. You’ll be happy you did. Ready to tackle this year’s vegetable garden? Our blog, Yard/Garden To-Do’s Part 2: Planting a Vegetable Garden, will help you decide what you need to get started. Whether it’s tillers and wheelbarrows or nail guns and circular saws, our helpful staff can help you choose the right tools for your next DIY gardening project. Don’t hesitate to contact us or stop by our store if you have questions about pricing or how to’s — we’re open seven days a week.